The controversial auction of Michael Jackson’s property from his Neverland ranch has been canceled, and all of the items will be returned to Jackson, the auction organizer said. The singer sued the auction company last month, claiming he did not authorize the sale of items that were removed from Neverland after he sold the ranch. 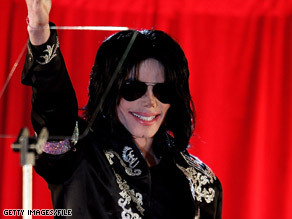 “We resolved everything with Michael Jackson,” Julien’s Auctions owner Darren Julien said. “We came to a resolution that both sides are very happy with.” Details of the settlement are confidential, Julien said. The public can still “get a glimpse at Neverland and the life and career of Michael Jackson” because the items will remain on exhibit in Beverly Hills, California, until April 25, Julien said. The exhibition was a prelude to the planned auction. After April 25, the items will go back to Jackson’s control, Julien said. The items, including the iconic Neverland gates, the singer’s famed white-jeweled glove and a stretch Rolls Royce, were removed by the auction house last year at Jackson’s request, the auctioneer told CNN. Jackson’s lawyer did not immediately respond to calls for comment. Jackson sold Neverland ranch, his former home, last year. Since his 2005 acquittal in the United States on child molestation charges Jackson has spent much of his time living in Bahrain. Jackson is set to perform 50 “final curtain call” concerts in London, England, starting in July. The shows sold out in four hours last month, the events’ organizers said. “These will be my final shows performing in London,” he said.